Some weeks making it to Thursday is a feat. Slump-ville USA. So close to the weekend yet oh so very far away! I am not sure about you but Thursdays are my hardest days. The thought of another meeting or conference call just makes you want to curl under my desk and hide! Spreadsheets and reports oh my! So I'd thought I start a little tradition for the blog, share a little treat that would make us all happy girls (if they were ours!) And hopefully they all become ours! I love how simple, bright, and sear-sucker-esque this little gem is! Plus Nixon watches are the shizz, they are very high quality and seem to last forever - I had one in High School which had it's last days just a year ago. Would you love this little treat this week? I want this plus I won't have to get it sized. That's a BIG plus. I want it sooo bad!! I think after my no shopping ban is over I will! me loves it! I hear ya...Tired doesn't not begin to cover how I feel today. Bring on Friday! Love the watch! i love this. i have been looking for a new watch and this might be the winner. 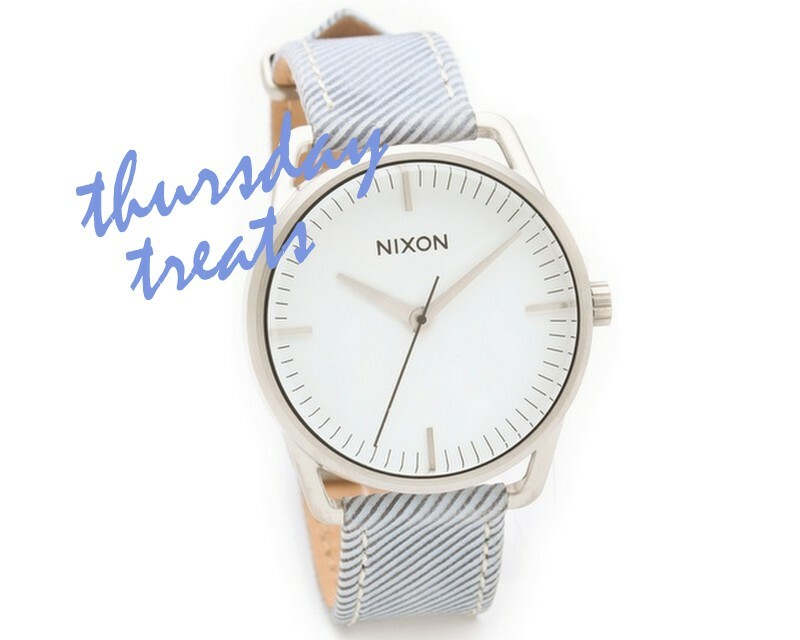 LOVING this pretty, preppy watch! Beautiful watch, different strap, like it .